Gnocchi: Love them! And hadn’t made them for quite some time, so this challenge came to the right time. Only, I did not have all that much time, crazy work month this month, so I decided to go for something easy, but fun. I wanted coloured gnocchi. And since we’ve discovered a new market stand, which sells old, and interesting, and colourful vegetables, the idea came to make purple gnocchi. With a purple potato, which I love anyway, because it is so pretty, and very tasteful. The potato on offer was called ‘blauer Hermann’, a solid potato, which was however, according to the guy who sold them, very good for mashed potato as well. Which meant to me: good gnocchi potato. I used a variant of a recipe I have been using for gnocchi before, which comes from the silver spoon: 500 gram potatoes, 100 gram flour (or a little more), 1 small egg, a little salt. Cook the potatoes in salted water until done, mash them as good as you can (use a ricer, that’s the easiest way), and let it cool a little. Then mix with flour and egg. If it is too sticky: add some more flour. The more flour, the less light they get. I do not mind the stickyness all that much. When everything is mixed well, I flour the working space on which I will be rolling very well, and my hands as well. Then I put one largetablespoon of gnocchi dough on the working space, roll the dough until it is about as thick as my smallest finger (this actually really is a matter of taste I think) and then cut them in 1 cm size (well about) pieces. I never bothered with scoring the pieces on a board or with a fork, probably because I am too lazy. Never mind, I think the gnocchi taste just as well (it might be better for the sauce though). Set the gnocchi that are done aside on a floured plate or so. Then boil a huge pan of water, and through in the gnocchi, in small portions. They are done as soon as they are getting to the surface again. Get them out, and boil the rest. We ate these gnocchi (aren’t they pretty? ), with brown butter with sage and pine nuts and lots of parmesan. Hmmmm nice! 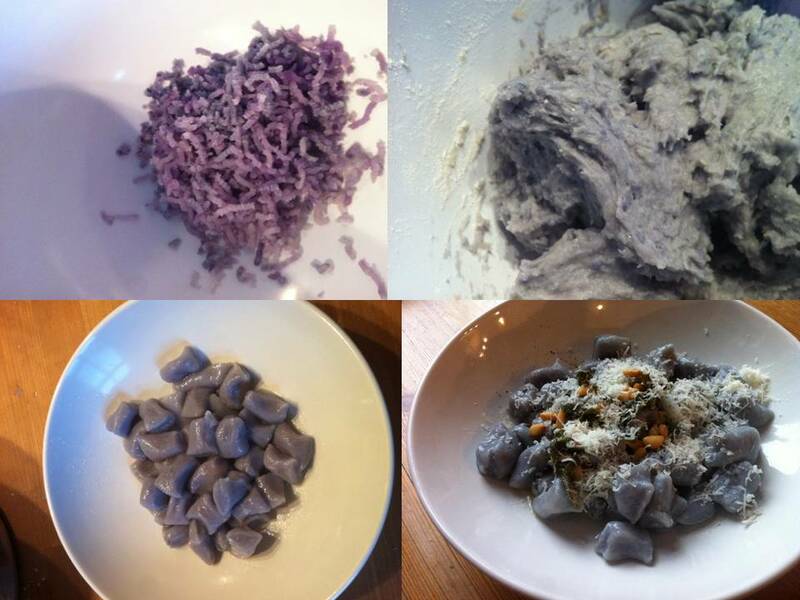 This entry was posted in ate, cooked and tagged blauer Hermann, daring kitchen, gnocchi on September 15, 2013 by esthercooks.